My student, Hamagashira San, invites me to a restaurant. He says to me "maybe you'll blog about it". I know that he has read my blog, and because of that I know that he's not going to take me to any regular place; part of me was curious, and part of me was a little anxious. "It's a little far from the station," he says. Honestly, I didn't know what to expect. 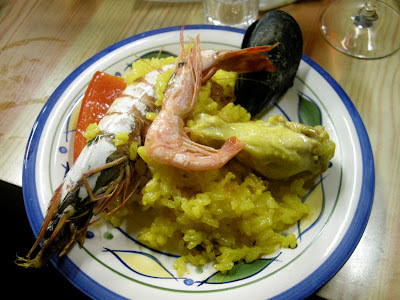 I knew there would be counter seating; I knew the restaurant was only open Thursdays, Fridays and Saturdays; I knew the owner was from Okinawa and lived in Spain for a while, and cooked Okinawan-Spanish food. 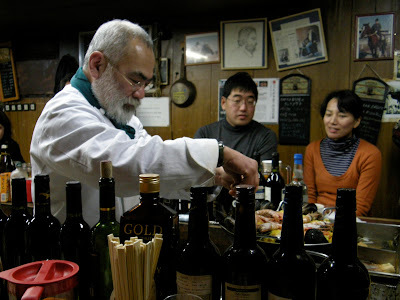 Saturday night my wife and I meet up with Hamagashira San and a friend of his, Tsurumi San. From JR Taisho Station, we jump in a cab, we get out and walk until I really have totally lost my bearings. Eventually the party arrives at Toshi's restaurant. It's not really a restaurant, more of a hideaway with a reputation for good food. The place is filled with personal mementos, wine bottles and odds and ends. Toshi himself is a wonderful personality. 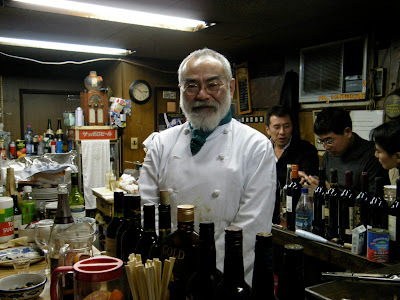 He's got a bristling beard, a broad smile and round spectacles, speaks Japanese, Spanish and English. He's actually Tsurumi San's Spanish teacher. And by golly can he cook. The food was what was the most memorable of the evening. 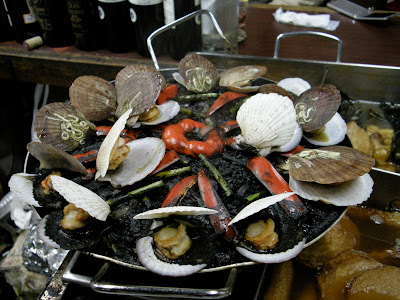 We had hardly sat down before Okinawan Oden was placed before us; this was followed up by bouillabaisse, and two types of paella, one done with abalone and squid ink. See the pictures above and below. I was pretty manpuku • 満腹 by the time I left. I'm pretty sure that no one who reads this blog has been there (except those I went with). 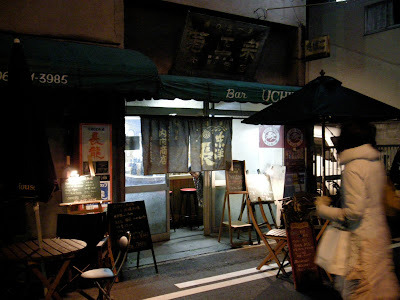 I've put the link on the Tsunagari D google my maps: call up Toshi, make a reservation, print out the map, see if you can find it and go and have a good meal! I know EVERYTHING creative in Kansai, even the hidden stuff. 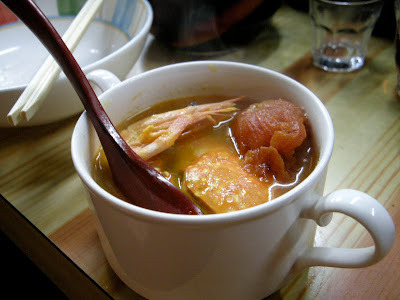 Right here on Tsunagari D.
It was a great time that we ate Okinawan-Spanish food together in the deep place of Taisho. Toshi,my spanish teacher,said that you and your wife were wonderful person and thanked your coming. Yeah, it was great! Totally awesome. Thanks for the invite, hope we can go again sometime!